Post news Report RSS	0.4.5 Released! Alpha 0.4.5 released. Important features include NPC dialogue, NPC loot tables, new items, expanded chat console logging, balancing, and bug fixes. Alpha 0.4.5 has been released. Important features include NPC dialogue, NPC loot tables, new items and crafting recipes, expanded chat console logging, balancing, and bug fixes. The new items and crafting recipes are geared toward two new upcoming skills: baking and brewing. The items include barley, malt, yeast, flour, and yeast traps. Wheat flour and raw barley must be ground using stone bars, malt is created by placing raw barley on any hard surface, and yeast is collected with the yeast trap, which itself must be crafted from linen cloth, flour, and a bucket of water. The following image shows several of those items in place in the game world. NPC dialogue was an important addition, allowing game masters to flesh out the world lore and provide players with information, directions, and engaging stories. world.cfg property 'environment.hour.length' added (hour length in milliseconds). Fixed issues with default startup (no world defined). Made world config properties available. 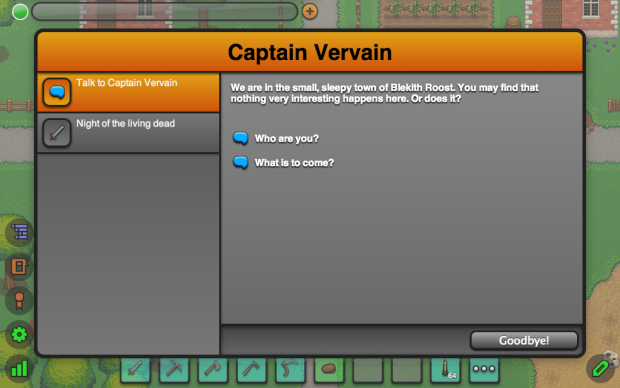 Gave Captain Vervain some dialogue. Added support for multiple audio channels. Defaults to 20. Added support for items to have an audio track play when used. Added audio to the zombie attack. Added flour, yeast, barley, barley malt, and yeast traps. Added crafting recipes for the flour, raw barley, yeast and yeast trap. Barley is malted by placing raw barley on a hard surface and waiting. Fixed a bug causing the player's quest data to be lost. Fixed a bug causing an unneeded account save occurring upon initial connection to the server. Fixed a bug with using the /spawn command to spawn an NPC without a spawner attached. Began to draft out the concepts of brewing and baking. Implemented the ability to have items in recipes that are not consumed in the process of the crafting. Completed the NPC dialogue system. Fixed issue LUGDUNON-247. Sprouts now impart no impassability. Fixed issue LUGDUNON-244. The recent sprite rendering code update broke this. The needed code was re-added to rectify the oversight. Fixed issue LUGDUNON-240. Fixed the underlying issue causing this and also changed the behavior somewhat. GMs now have an elevation overlay toggle button when editing elevation to show or hide the overlay at will. Addressed 2/3 of issue LUGDUNON-241. Added client notification when experience rewarded. Added client notification when items rewarded from quest. Added client notification when an advancement is gained or lost. Added the ability to report current time using "/time" with no arguments. Added handleAsPlayer() functionality to GmOnlyConsoleFiredCommand. Fixed issue LUGDUNON-243. Warping should no longer cause Doppelgängers. Began work on expanding the example world into an actual playable campaign to provide a much better introduction to Lugdunon's capabilities. Fixed a bug with the weak npc melee attack causing an exception on the client and not rendering the attack animation. Implemented NPC loot tables. Yep, NPCs can now drop loot. Reduced the damage on the NPC weak melee attack. Balanced some of the spawns. Balanced the rewards for Vervain's quests. New characters now start out with a stone sword and 32 baked potatoes. Added loot drops to Zombies and the Highwayman boss. 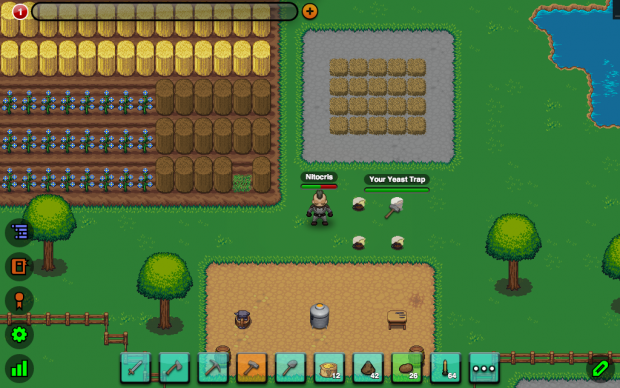 Added three new screenshots to the lugdunon.net home page. Added prominent open alpha button to the home page.